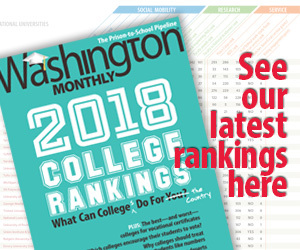 Washington Monthly | The Most Selective Class Ever! The Most Selective Class Ever! The college-bound population has grown, and so, too, has the number of applications students file, thanks in part to online technology. But wherever it is raining applications, colleges have helped seed the clouds — by recruiting widely and aggressively for ever more applicants. Although the tension between mission and marketing has long defined admissions, many believe the balance has tilted too far toward the latter. Many colleges have made applying as simple as updating a Facebook page. Some deans and guidance counselors complain that it’s too easy. They question the ethics of intense recruitment by colleges that reject the overwhelming majority of applicants. Many universities try to make their colleges attractive and easy to apply to. This is done not so much to make high school students lives easier, but so that colleges can reject more students. Stanford rejected 93 percent of applicants. Brown rejected 91 percent of them. UCLA got 57,670 applications, and now the school claims to be “the most popular campus in the nation.” UCLA will only admit a freshman of about 12,000, however. So for 80 percent of applicants UCLA might start to look a little less popular once the rejection letters come in. The truly odd part about this, however, is that surely there aren’t 57,000 people for whom UCLA would really be the best school. A lot of this application volume comes from the university’s efforts to make the school look right for all high school students, even those who don’t belong there. Some of Chicago’s leaders concluded that the admissions office had trapped the university in a niche. It had long been dogged by a stereotype as a place for nerds and social misfits who shun sunlight and conversation. T-shirts created by students lovingly mock the university (the most famous is “Where Fun Comes to Die”). In recent years, the university has built new residential complexes, and expanded its study-abroad programs, career-counseling services and recreational offerings. These efforts didn’t make student body at the University of Chicago any more diverse, but it sort of made Chicago look more conventional. So more students applied and Chicago could reject them. But nerds are supposed to go to Chicago. That’s the point. That’s what makes the school distinct. What all this admissions advertising creates is a sort of McMansion version of college. Colleges are different, but they certainly don’t seem to be that different, at least not in marketing terms. Figuring out what really makes them distinct is fairly difficult for high school students. Not to mention that fact that a low admit rate means a lot more rejections. And rejections are disheartening. A nine percent admissions rate means the college is selective, yes. It also means, as former Dartmouth Admissions and Financial Aid Dean Karl Furstenberg explained, that a lot of “people keep hearing that they’re not good enough.” This is despite the fact that most of the applicants are fully capable of succeeding at the schools they apply to and many, many applicants have virtually identical backgrounds and statistics.